Rather than just provide a complete list of my favorite blogs and websites under “Check out my favorite places,” I decided to add them one at a time and let you know exactly why I like them. That way, you’ll be able to determine whether or not the site might be of interest to you. Besides, I believe that these sites do such an awesome job of providing information and/or entertainment that it really is a pleasure to bring them to your attention! First up is CampsitePhotos.com. CampsitePhotos.com (link HERE) is a site that I’ve been recommending to fellow campers for several years. Greg travels all over the United States and photographs nearly every campsite in every campground he visits. I can’t even begin to tell you how much his photos have helped me with trip planning. Even when I can find information on the length and width or the sun and shade situation of the campsites in a particular campground, that information doesn’t really guarantee that we’ll fit in it or like it. Measurements vary from campground to campground and swing room can be a major factor. 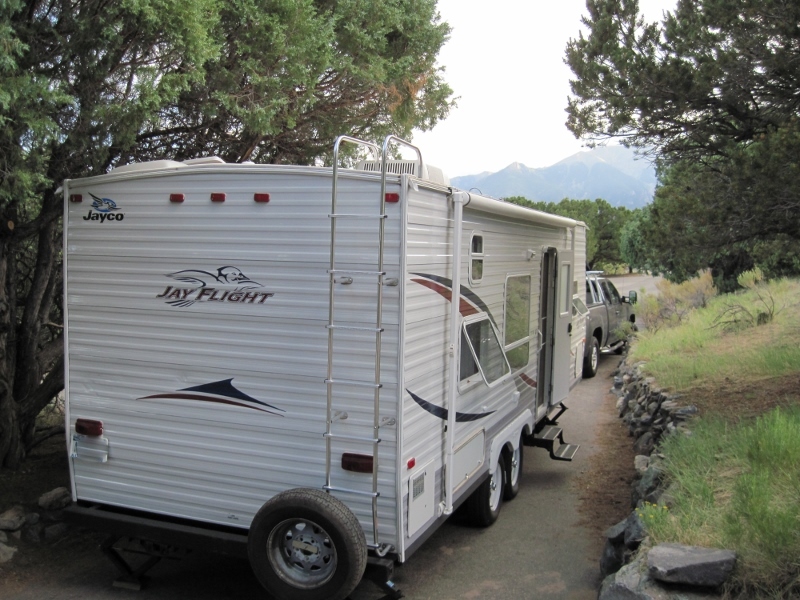 Sometimes knowing that there is another 4 or 5 feet of open space beyond a curb at the back of your site would make a huge difference but very few campgrounds provide that kind of information. Although both public and private campgrounds are listed on CampsitePhotos.com, Greg focuses on photographing campsites at public campgrounds – those in State and National Parks. This meshes perfectly with our personal travel style and I’ve spent many hours on the site trying to find just the right spot to call home. Even if a campground has posted photos on ReserveAmerica.com, Recreation.gov, through its own reservation system or on its own web site, Greg’s photos are most often of better quality and they sometimes provide a different perspective. CampsitePhotos.com also provides a list of camping resources, and Greg’s blog has links to some valuable info such as campground reviews and recommendations, camping tips (check out the photography series!) and camping news. This website does an excellent job of supplying outdoor enthusiasts with extremely useful information. I don’t know how many miles Greg has traveled in this quest, but he deserves a round of applause for the work he has accomplished and his outstanding efforts on our behalf. Many thanks, Greg! Here’s a tip to reflect upon . . . If you like the looks of a specific campsite but you’re still not quite sure that your rig will fit, give the campground a call and ask to speak to the staff member who photographed the sites for whatever web site you’re looking at. If that person isn’t available, ask who in the campground has the best knowledge of the site specs and ask to speak to him/her. I did this when I wanted to book a reservation at the Pinyon Flats Campground in Great Sand Dunes National Park. Because some of the photos showed overhanging trees or a measurable slope, I made that call and I was told that someone would call me back. I have to say that I wasn’t exactly optimistic that it would happen. But, a few hours later, I received a call from the Park Ranger who had photographed the sites for Recreation.gov. Not only did he have a complete and thorough knowledge of all of the sites in the campground but, after asking about the type of rig we’d be traveling with, he steered me away from one site I liked due to the slope and was able to assure me that we would definitely fit in another site that looked a little too tight for us in the photo. We fit just fine and it was a gorgeous site as you can see by the photo below. We all know that a great campsite sets the stage for a delightful experience. So don’t hesitate to call ahead and ask questions! And be sure to check out CampsitePhotos.com either here or via the link to the right under "Check out my favorite places!" I wouldn't be the least bit surprised if it becomes one of your favorite sites, too!